The Cowboys opened the practice by giving some of their new walk-on kickers some work. They include true freshmen Rayan Rafae and Tristan Bailey, and junior Alex Langer from Iowa Western Community College. Rafae made a couple field goals from close range, and Langer made one from about 40 yards. However, all three struggled. Redshirt sophomore quarterback Aaron Young was the holder on all the kicks. It also looks like he will be the scout team quarterback in UW’s preparations for North Dakota on Sept. 5. Second-year coach Craig Bohl said the morning practice wasn’t the best UW has had during camp. He also said there is some game-planning going on for the season-opener Sept. 5 against North Dakota. UW is down to three scholarship tight ends, and four overall after the knee injury to redshirt freshman Grant Lewis in last Saturday’s scrimmage. Junior Jacob Hollister, redshirt freshman Tyree Mayfield and true freshman Josh Harshman are the guys on scholarship. True freshman walk-on Tye Brown of Laramie also is there. I asked tight ends coach Shane LaDage before practice how Lewis was doing, and he said the team is still awaiting results from an MRI. But with not many guys, LaDage said the group will be fine. For more on him, see Tuesday’s Wyoming Tribune Eagle and Laramie Boomerang, and log on to wyosports.net. Scouts from the Houston Texas and Jacksonville Jaguars were are Monday morning’s practice. 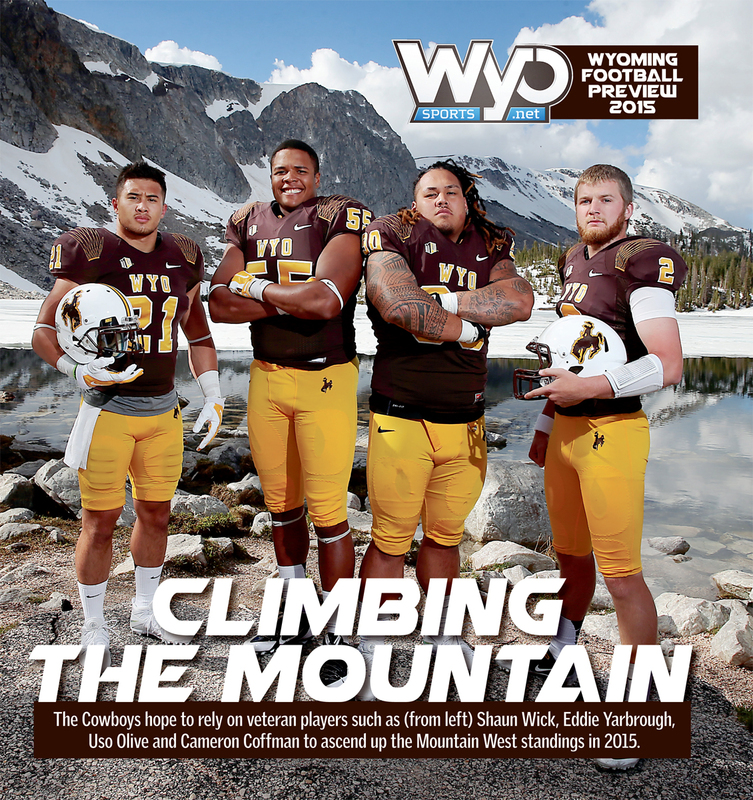 And, we are less than a week away from publication of WyoSports’ 2015 UW football preview section. Nearly 60 pages of UW and Mountain West football content. Pick up a copy of Sunday’s Wyoming Tribune Eagle and Laramie Boomerang for your copy. Here is what the cover looks like. 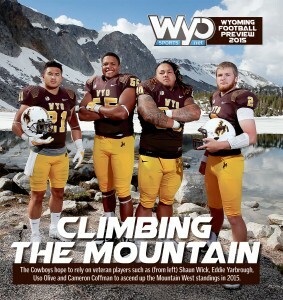 This entry was posted in Football and tagged Aaron Young, Alex Langer, Brian Hill, Grant Lewis, Jacob Hollister, Josh Tapscott, Nico Evans, Rayan Rafae, Shaun Wick, Tristan Bailey, Tye Brown, Tyree Mayfield, Wyoming Cowboys, Wyoming Football by Robert Gagliardi. Bookmark the permalink.